These free Valentine box templates at Mr. Printable made me smile. Who needs pink anyhow? 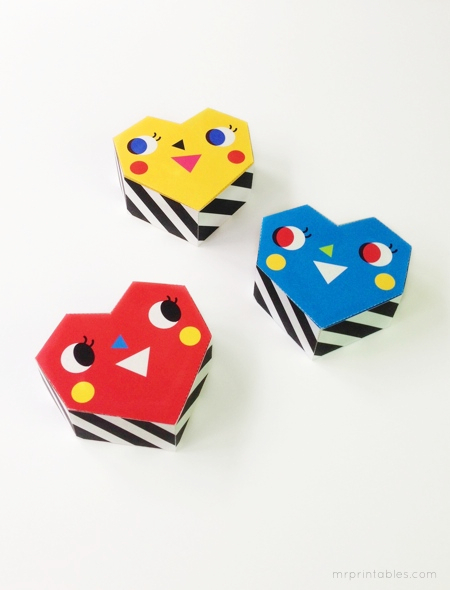 Choose heart-shaped favor boxes with faces, or two other options with triangles and stripes. oh my gosh so cute! i'm going to have to make some. these are so cute and colourful!! Oh they are cute! They would make a good little tooth fairy box for my boys too!! ahhhh too cute! Always love their printables. Oh, funny little boxes! I love those! Ooo, girl, I saw your fireworks fabric in a Windex ad. Fancytown! Cute! Or you could use two Hexagons and a small and larger triangle! Jessica, I've heard about that Windex commercial. I feel famous. Very cute... I like unconventional!